Twelve Russian intelligence officials have been indicted in special counsel Robert Mueller's probe into 2016 election hacking. Jonathan Dienst reports. Twelve Russian intelligence officials have been indicted in special counsel Robert Mueller's probe into 2016 election hacking for allegedly infiltrating the Democratic National Committee and Hillary Clinton presidential campaign ahead of the 2016 election, Deputy Attorney General Rod Rosenstein announced Friday. The indictment — which comes days before President Donald Trump holds a summit with Russian President Vladimir Putin — was the clearest allegation yet of Russian efforts to meddle in American politics, though no Americans are named in it as conspirators. U.S. intelligence agencies have said the interference was aimed at helping the presidential campaign of Trump, a Republican, and harming the election bid of Clinton, his Democratic opponent. Rosenstein revealed the alleged sweeping and coordinated effort to break into key Democratic email accounts in an announcement at the Justice Department in Washington just as Trump was arriving for a meeting with Queen Elizabeth at Windsor Castle in the United Kingdom. The officials are accused of hacking into top Democratic organizations, including the Democratic National Committee and the Hillary Clinton campaign, ahead of the 2016 election. Rosenstein said he briefed Trump on the charges earlier this week and the president was aware of the announcement. Before the indictments were announced on Friday, Trump referred to the Russia investigation as a"rigged witch-hunt" that hurts the U.S. relationship with Russia. He also said that he "will absolutely bring up meddling" in his meeting with Russia. One of Trump's lawyers, Rudy Giuliani, tweeted that because no Americans were involved, "Time for Mueller to end this pursuit of the President and say President Trump is completely innocent." Mueller's investigation continues and Rosenstein said only that there was "no allegation in this indictment that any American was a knowing participant in this illegal activity." The White House responded to the indictment by noting it did not allege that the hacking changed the result of any election or that any Americans knew they were corresponding with Russians or had committed a crime. "This is consistent with what we have been saying all along," a spokeswoman said. The statement does not condemn Russia for the alleged election interference. The head of the DNC called on Trump and the Republican party to take the threat to national security urgently. "The Kremlin's efforts to disrupt our electoral process have grave implications for our democracy," DNC Chair Tom Perez said in a statement. "Donald Trump and his Republican enablers' efforts to discredit these established facts only embolden Putin's Russia and invite further attacks on our country." Top Democrats called on Trump to cancel his meeting with Putin. The Kremlin denied that it had tried to sway the election. "The Russian state has never interfered and has no intention of interfering in the U.S. elections," Putin's foreign affairs adviser, Yuri Ushakov, said Friday. The indictment doesn't contain allegations that the conspiracy managed to change the result of the election, nor does it say any Americans conspired with the Russians, though the indictment says an unnamed U.S. congressional candidate reached out to a fictitious hacker allegedly created by the Russians for stolen documents and received some. "There is no allegation in this indictment that any American citizen committed a crime. There is no allegation the conspiracy changed the vote count or affected any election result," Rosenstein said. Eleven of the officers are accused of hacking computers and stealing and releasing documents to interfere with the election, while the 12th allegedly conspired to infiltrate election administration organizations like boards of elections. Justice Department officials said information on about 500,000 voters was stolen from a state election board; officials didn't say what state. In March 2016, before hacking the DNC, the conspirators allegedly hacked the email accounts of volunteers and employees of Hillary Clinton's presidential campaign, including the email account of Clinton campaign chairman John Podesta. A month later, they hacked the computer networks of the DNC and Democratic Congressional Campaign Committee, according to the indictment. The Russians are accused of monitoring the computers of dozens of DCCC and DNC employees, implanting hundreds of files containing malicious computer code or malware and stealing emails and other documents. Beginning in June, the hackers released tens of thousands of stolen email and documents using fictitious online personae including "DCLeaks" and "Guccifer 2.0," according to the indictment. A candidate for U.S. Congress requested stolen documents from Guccifer 2.0 in August 2016 and received information on their opponent. That person is not named in the indictment. The indictment also mentions a written conversation between Guccifer 2.0 and "a person who was in regular contact with senior members" of Trump's campaign — political operative Roger Stone revealed last year that he had that conversation with Guccifer 2.0 but denied working with Russian officials to influence the election; U.S. officials hadn't named Guccifer as a Russian operative at the time. "As I testified before the House intelligence committee under oath, my 24-word exchange with someone on Twitter claiming to be Guccifer 2.0 is benign based on its content, context, and timing," Stone told the Daily Beast on Friday. "This exchange is entirely public and provides no evidence of collaboration or collusion with Guccifer 2.0 or anyone else in the alleged hacking of the DNC emails, as well as taking place many weeks after the events described in today’s indictment." The hackers also allegedly transferred many of their documents to an unnamed organization and discussed, through Guccifer 2.0, when to release them so they'd have a bigger impact on the election, according to the indictment. While the organization is unnamed in the indictment, WikiLeaks released Podesta's stolen emails. NBC has reached out to the organization for comment. The hackers began to "spearphish" — targeted emailing to trick a person into giving access to a computer network — the Clinton campaign and her private office on about July 27, 2016, the same day that Trump said at a news conference, "Russia, if you are listening, I hope you are able to find the 30,000 emails that are missing" from Hillary Clinton's database. This March, NBC News reported that Mueller was assembling a criminal case against the Russians who carried out the hacking and leaking of private information designed to hurt Democrats in the 2016 election. The charges were expected to rely on secret intelligence gathered by the CIA, the FBI, the National Security Agency and the Department of Homeland Security, NBC reported. 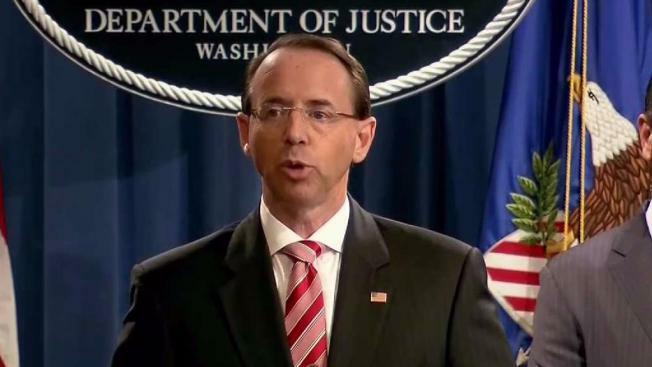 Rosenstein called on Americans to put aside partisan squabbling over Mueller's investigation and work together to keep the perpetrators accountable. 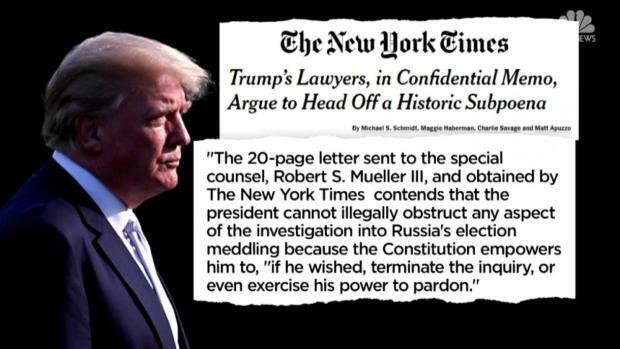 A memo from President Donald Trump's legal team to special counsel Robert Mueller obtained by The New York Times claims that, as the nation's top law enforcement officer, the president cannot obstruct justice, may shut down any investigation and even pardon himself. Still Rudy Giuliani, one of the president's attorneys, says Trump would never pardon himself or shut down the Russia investigation. "Partisan warfare fueled by modern technology does not fairly reflect the grace, dignity and unity of the American people," he said. "The blame for election interference belongs to the people who committed election interference." The Mueller probe had already resulted in the indictments of 20 people, chief among them Trump’s former campaign chairman Paul Manafort, who has been charged with tax and bank fraud, obstruction of justice and other crimes. Manafort has denied all accusations and is in jail awaiting the start of his trial later this month. Former national security adviser Michael T. Flynn pleaded guilty to lying to the FBI about conversations with the Russian ambassador. In addition to Flynn, four others have pleaded guilty: George Papadopoulos, a former campaign adviser; Richard Pinedo, who sold bank account numbers to Russians; Rick Gates, a former campaign adviser; and Alex van der Zwaan, a lawyer. Others who have been indicted: 13 Russian nationals accused of conspiracy to defraud the United States and Konstantin Kilimnik, a Russian-Ukrainian political consultant associate of Manafort's. Scott Gelman, Allie Weintraub and The Associated Press contributed to this report.